Opioids were the most harmful drug type and accounted for 70 per cent of the negative health impact associated with drug use disorders worldwide. To celebrate 20 years since its inception, the World Drug Report 2017 is presented in a new five-booklet format. The intention is to improve reader friendliness while maintaining the wealth of information contained within. Here is the thematic web site for the World Drug report 2017. The report was launched on the 22nd of June at a meeting in Vienna for UN member states and NGO representatives. “There is much work to be done to confront the many harms inflicted by drugs to health, development, peace and security, in all regions of the world,” said UNODC Executive Director Yury Fedotov on that occasion. He pointed to the UNGASS Outcome Document from 2016 where more than 100 recommendations to reduce demand and supply can be found. According to the report about a quarter of a billion people used drugs in 2015, but this is still only around five per cent of the world’s population. Of these, around 29.5 million people - or 0.6 per cent of the population - were engaged in problematic use and suffered from drug use disorders, including dependence. Opioids were the most harmful drug type and accounted for 70 per cent of the negative health impact associated with drug use disorders worldwide. The report also addresses the rapidly emerging challenge for global drug policies; the new psychoactive substances (NPS). 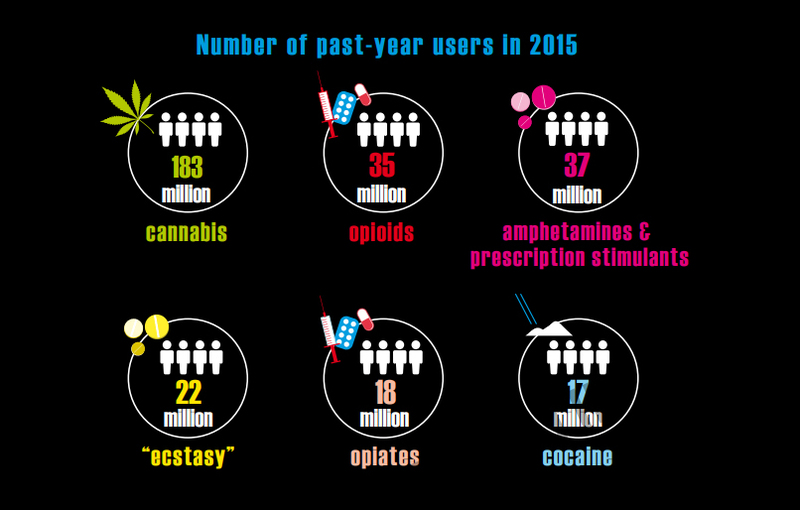 While the market for NPS is still relatively small, users are unaware of the content and dosage of psychoactive substances in some NPS. This potentially exposes users to additional serious health risks. The number of reported substances had nearly doubled to 483 in 2015 compared with 260 NPS in 2012. 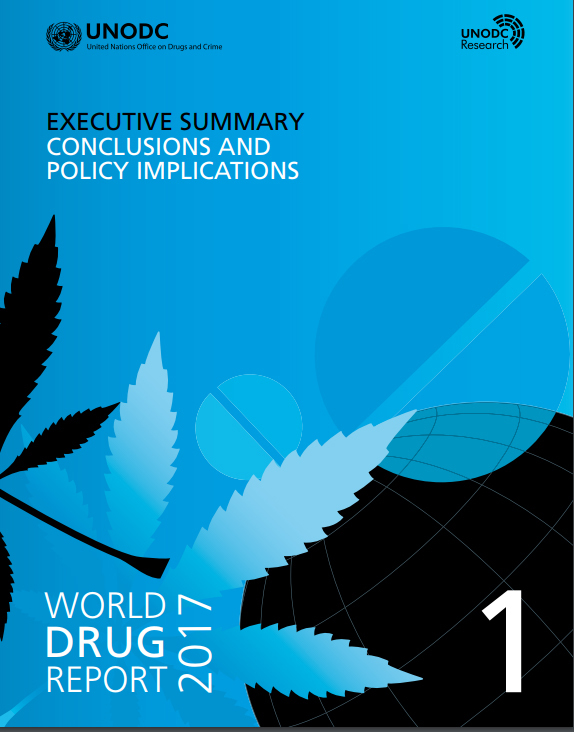 Booklet 1 of the World Drug Report 2017 summarizes the content of the four subsequent substantive booklets and presents policy implications drawn from their findings. Booklet 2 deals with the supply, use and health consequences of drugs. Booklet 3 focuses on the cultivation, production and consumption of the three plant-based drugs (cocaine, opiates and cannabis) and on the impact of new cannabis policies. Booklet 4 provides an extended analysis of the global synthetic drugs market and contains the bulk of the analysis for the triennial global synthetic drugs assessment. Finally, Booklet 5 contains a discussion on the nexus between the drug problem, organized crime, illicit financial flows, corruption and terrorism. The five booklets can be downloaded in pdf versions here.